Twitter application creation is no longer available through apps.twitter.com. This tutorial is in the process of being updated to include the new Twitter API. 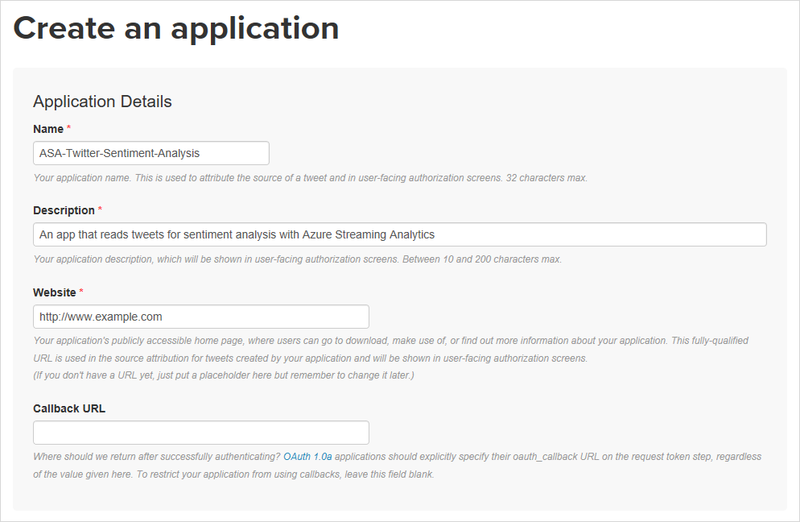 Learn how to build a sentiment analysis solution for social media analytics by bringing real-time Twitter events into Azure Event Hubs. You can then write an Azure Stream Analytics query to analyze the data and either store the results for later use or use a dashboard and Power BI to provide insights in real time. Social media analytics tools help organizations understand trending topics. Trending topics are subjects and attitudes that have a high volume of posts in social media. Sentiment analysis, which is also called opinion mining, uses social media analytics tools to determine attitudes toward a product, idea, and so on. A company that has a news media website is interested in gaining an advantage over its competitors by featuring site content that is immediately relevant to its readers. The company uses social media analysis on topics that are relevant to readers by doing real-time sentiment analysis of Twitter data. To identify trending topics in real time on Twitter, the company needs real-time analytics about the tweet volume and sentiment for key topics. In other words, the need is a sentiment analysis analytics engine that's based on this social media feed. A Twitter application, and the OAuth access token for that application. We provide high-level instructions for how to create a Twitter application later. The TwitterWPFClient application, which reads the Twitter feed. To get this application, download the TwitterWPFClient.zip file from GitHub and then unzip the package into a folder on your computer. If you want to see the source code and run the application in a debugger, you can get the source code from GitHub. The sample application generates events and pushes them to an Azure event hub. Azure event hubs are the preferred method of event ingestion for Stream Analytics. For more information, see the Azure Event Hubs documentation. In this procedure, you first create an event hub namespace, and then you add an event hub to that namespace. Event hub namespaces are used to logically group related event bus instances. Log in to the Azure portal and click Create a resource > Internet of Things > Event Hub. In the Create namespace blade, enter a namespace name such as <yourname>-socialtwitter-eh-ns. You can use any name for the namespace, but the name must be valid for a URL and it must be unique across Azure. Select a subscription and create or choose a resource group, then click Create. Click the new namespace, and in the namespace blade, click + Event Hub. Name the new event hub socialtwitter-eh. You can use a different name. If you do, make a note of it, because you need the name later. You don't need to set any other options for the event hub. Before a process can send data to an event hub, the event hub must have a policy that allows appropriate access. The access policy produces a connection string that includes authorization information. In the event namespace blade, click Event Hubs and then click the name of your new event hub. 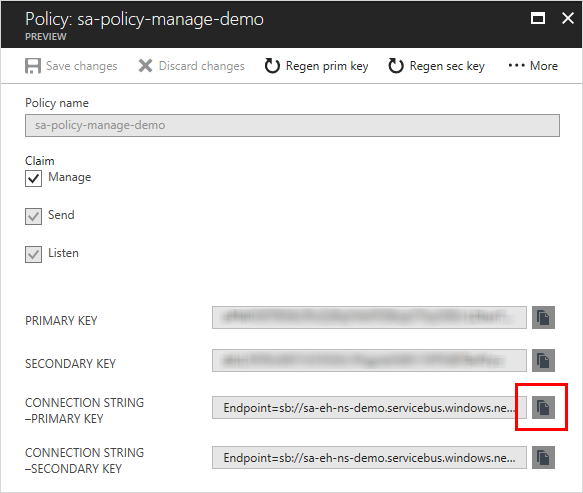 In the event hub blade, click Shared access policies and then click + Add. Make sure you're working with the event hub, not the event hub namespace. 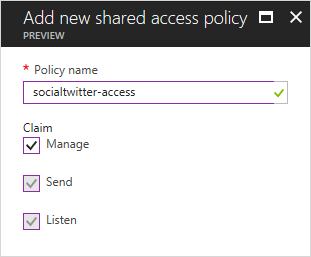 Add a policy named socialtwitter-access and for Claim, select Manage. After the policy has been deployed, click it in the list of shared access policies. Find the box labeled CONNECTION STRING-PRIMARY KEY and click the copy button next to the connection string. Paste the connection string into a text editor. You need this connection string for the next section, after you make some small edits to it. Notice that the connection string contains multiple key-value pairs, separated with semicolons: Endpoint, SharedAccessKeyName, SharedAccessKey, and EntityPath. For security, parts of the connection string in the example have been removed. The client application gets tweet events directly from Twitter. In order to do so, it needs permission to call the Twitter Streaming APIs. To configure that permission, you create an application in Twitter, which generates unique credentials (such as an OAuth token). You can then configure the client application to use these credentials when it makes API calls. If you do not already have a Twitter application that you can use for this tutorial, you can create one. You must already have a Twitter account. The exact process in Twitter for creating an application and getting the keys, secrets, and token might change. If these instructions don't match what you see on the Twitter site, refer to the Twitter developer documentation. Go to the Twitter application management page. Leave the callback field blank. The client application you use for this tutorial doesn't require callbacks. Optionally, change the application's permissions to read-only. When the application is created, go to the Keys and Access Tokens page. Click the button to generate an access token and access token secret. Keep this information handy, because you will need it in the next procedure. The keys and secrets for the Twitter application provide access to your Twitter account. Treat this information as sensitive, the same as you do your Twitter password. For example, don't embed this information in an application that you give to others. After the tweet events have been assigned a sentiment value, they are pushed to the event hub that you created earlier. Run the application, and then use the application's UI to enter the keys, secrets, and connection string. If you do this, the configuration information is used for your current session, but it isn't saved. Edit the application's .config file and set the values there. This approach persists the configuration information, but it also means that this potentially sensitive information is stored in plain text on your computer. The following procedure documents both approaches. Make sure you've downloaded and unzipped the TwitterWPFClient.zip application, as listed in the prerequisites. The Twitter Consumer Key (API Key). The Twitter Consumer Secret (API Secret). The Twitter Access Token Secret. The connection string information that you saved earlier. Make sure that you use the connection string that you removed the EntityPath key-value pair from. The Twitter keywords that you want to determine sentiment for. Set oauth_consumer_key to the Twitter Consumer Key (API Key). Set oauth_consumer_secret to the Twitter Consumer Secret (API Secret). Set oauth_token to the Twitter Access Token. Set oauth_token_secret to the Twitter Access Token Secret. Set EventHubName to the event hub name (that is, to the value of the entity path). Set EventHubNameConnectionString to the connection string. Make sure that you use the connection string that you removed the EntityPath key-value pair from. If you didn't already start the application, run TwitterWpfClient.exe now. Click the green start button to collect social sentiment. You see Tweet events with the CreatedAt, Topic, and SentimentScore values being sent to your event hub. Now that tweet events are streaming in real time from Twitter, you can set up a Stream Analytics job to analyze these events in real time. In the Azure portal, click Create a resource > Internet of Things > Stream Analytics job. Name the job socialtwitter-sa-job and specify a subscription, resource group, and location. It's a good idea to place the job and the event hub in the same region for best performance and so that you don't pay to transfer data between regions. The job is created and the portal displays job details. In your Stream Analytics job, under Job Topology in the middle of the job blade, click Inputs. Input alias: Use the name TwitterStream. If you use a different name, make a note of it because you need it later. Source type: Select Data stream. Import option: Select Use event hub from current subscription. Service bus namespace: Select the event hub namespace that you created earlier (<yourname>-socialtwitter-eh-ns). Event hub: Select the event hub that you created earlier (socialtwitter-eh). Event hub policy name: Select the access policy that you created earlier (socialtwitter-access). Stream Analytics supports a simple, declarative query model that describes transformations. To learn more about the language, see the Azure Stream Analytics Query Language Reference. 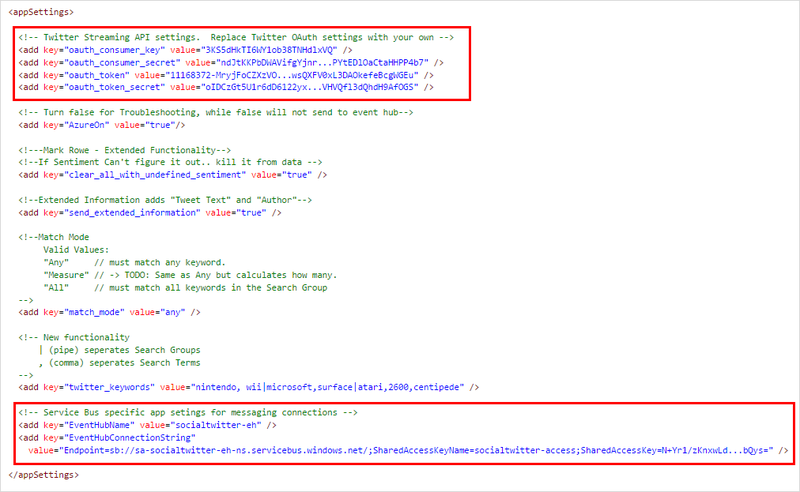 This tutorial helps you author and test several queries over Twitter data. To compare the number of mentions among topics, you can use a Tumbling window to get the count of mentions by topic every five seconds. Close the Inputs blade if you haven't already. In the Overview blade, click Edit Query near the top right of the Query box. Azure lists the inputs and outputs that are configured for the job, and lets you create a query that lets you transform the input stream as it is sent to the output. Make sure that the TwitterWpfClient application is running. In the Query blade, click the dots next to the TwitterStream input and then select Sample data from input. This opens a blade that lets you specify how much sample data to get, defined in terms of how long to read the input stream. Set Minutes to 3 and then click OK. The sample data is stored temporarily and is available while you have the query window open. If you close the query window, the sample data is discarded, and you have to create a new set of sample data. If didn't use TwitterStream as the alias for the input, substitute your alias for TwitterStream in the query. This query uses the TIMESTAMP BY keyword to specify a timestamp field in the payload to be used in the temporal computation. If this field isn't specified, the windowing operation is performed by using the time that each event arrived at the event hub. Learn more in the "Arrival Time vs Application Time" section of Stream Analytics Query Reference. This query also accesses a timestamp for the end of each window by using the System.Timestamp property. Click Test. The query runs against the data that you sampled. The following table lists the fields that are part of the JSON streaming data. Feel free to experiment in the query editor. You have now defined an event stream, an event hub input to ingest events, and a query to perform a transformation over the stream. The last step is to define an output sink for the job. 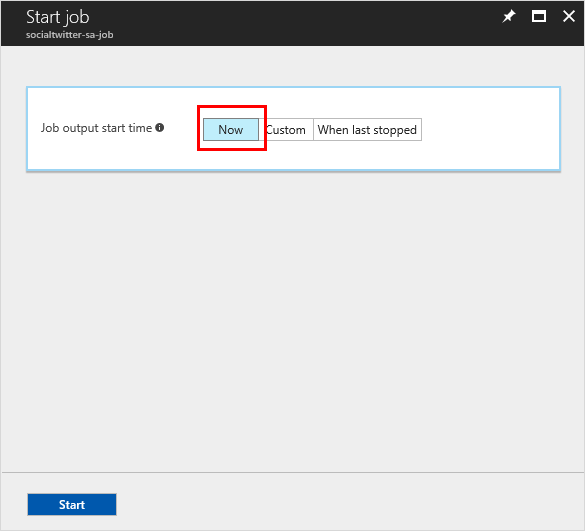 In this tutorial, you write the aggregated tweet events from the job query to Azure Blob storage. You can also push your results to Azure SQL Database, Azure Table storage, Event Hubs, or Power BI, depending on your application needs. In the Job Topology section, click the Output box. Output alias: Use the name TwitterStream-Output. Import options: Select Use blob storage from current subscription. Storage account. Select Create a new storage account. Storage account (second box). Enter YOURNAMEsa, where YOURNAME is your name or another unique string. The name can use only lowercase letters and numbers, and it must be unique across Azure. Azure creates the storage account and generates a key automatically. A job input, query, and output are specified. You are ready to start the Stream Analytics job. In the job blade, click Start. In the Start job blade, for Job output start time, select Now and then click Start. Azure notifies you when the job has started, and in the job blade, the status is displayed as Running. After your job has started running and is processing the real-time Twitter stream, you can view the output for sentiment analysis. Another query you can use to understand Twitter sentiment is based on a Sliding Window. To identify trending topics, you look for topics that cross a threshold value for mentions in a specified amount of time. For the purposes of this tutorial, you check for topics that are mentioned more than 20 times in the last 5 seconds. In the job blade, click Stop to stop the job. In the Job Topology section, click the Query box. Click Start to restart the job using the new query.